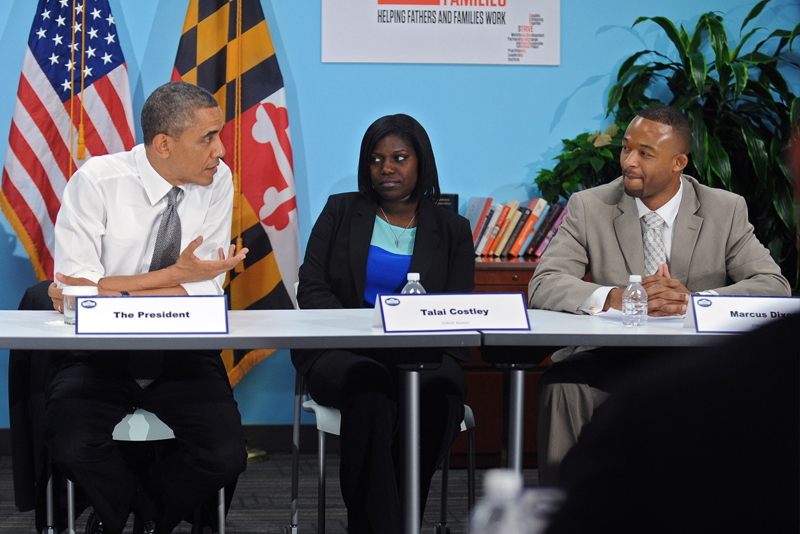 On Friday, May 17, President Barack Obama visited the Center for Urban Families during a day-long tour of Baltimore that focused on middle class jobs and economic opportunities. During the visit, President Obama met with CFUF founder and CEO Joe Jones, board chairman and Warnock Family Foundation founder David Warnock, and graduates of CFUF’s workforce development and fatherhood programs. President Obama listened to CFUF graduates – many of whom struggled to find work to support their families or served time in jail – and offered both sympathy and advice. “You know, one of the biggest challenges – I grew up without a father,” he said. “For your sons to see you taking this path, that’s going to make all the difference in the world. And in some ways, the fact that you started off a little rocky helps.” It can show them how far you came. The President also shared his message of economic opportunity and discussed the urgent need for job development and improvements in workers’ wages, both in Baltimore and across the nation. The President’s visit underscored both the importance of the work tackled by the Center for Urban Families, and validation of CFUF’s success as the organization enters its 15th year. In addition to his visit to CFUF, the President gave a speech at Ellicott Dredges, a Baltimore-based manufacturer of innovative dredging equipment, and stopped by a classroom at Moravia Park Elementary School.